Last week, I worked with a number of fabulous folks from the Triangle AMA to put on a Social Media Boot Camp. We had an amazing turnout with a talented lineup of speakers and a great group of eager participants. My presentation focused on how to Protect Your Brand in the Conversation Age. There was one section that I discussed that seemed to resonate with folks so I thought I would go into more detail here. One of the challenges when it comes to monitoring your company, products, people, brand and even yourself online is the incredible amount of information available. I work with several clients that their company name alone is written or spoken about online more than 5,000 times a day. Most companies don’t have the resources or the time to be able to go through all that noise. One of the ways I get through all the clutter is to triage my mentions. By triaging, I can quickly determine the discussions I need to spend more time and attention on and which ones I can kick to the curb immediately. 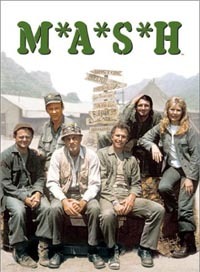 When I think of triage I always think of the old TV show MASH. Remember that show with Alan Alda based in the Korean War? When the helicopters and buses came in with wounded GI’s, they would go running out to meet them to determine which guys were hurt the worst. The triage allowed the soldiers with the most serious injuries to go to the head of the line ahead of the less serious. SearchStatus – My browser du jour is Firefox, if you happen to use Chrome, I am sure there are plugin’s like this one. SearchStatus is a free Firefox plugin that embeds the Google Page Rank, Alexa ranking and Compete numbers right on the bottom of your browser. Very quickly, I can go to a web page and get a good idea on what kind of visibility a specific webpage and website receives in Google as well as how much traffic it gets daily, weekly and monthly. Page Rank 9+ – Oprah – Owns it! Please remember if you are on a blog page that just launched, the page might not have any page rank because it is too new. My recommendation is to go to the blog’s home page and see what their page rank is there. Next let’s look at our Compete numbers. If you right click while your mouse hovers over the Compete graph, it will tell you the average monthly visitors the website receives. If you would like, you can click over to compete.com and get more information. Registration is required, but basic package is free. What kind of visibility a webpage/website has within Google. With knowing these two items, you can make an informed decision on whether this mention deserves more of your time or not. Though, I have one more item to add into your bag of tricks. I believe one important characteristic of an “influencer” is he/she creates or develops conversations on their own website as well as on other websites. I like to look at how many and what kind of comments does the original post have? How active of a community does this website have? Are there other conversations taking place elsewhere that are linking back to this original post? 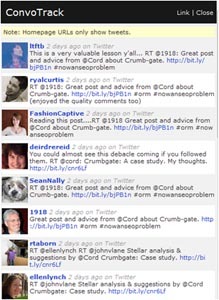 To see conversations on other websites linking back to one place, I like to use this cute little bookmarklet called Convotrack. This is a tool that you add to your bookmarks toolbar and when on a web page, you click it and it shows you any and all conversations taking place on the web that are linking back to a specific page. This quickly can show you how many folks are talking about the post and what kind of visibility is it receiving out on the interweb. Everything that I just walked through should take you no more than a couple of minutes to complete once you have the tools setup. Is this full proof? Absolutely not. All of these tools should not be taken as the gospel by any means. I believe these tools and others like them will allow you to quickly triage your online monitoring to help you spend more time on what is most important to you.